UPDATE: British Police have searched Oxford Street and have found no evidence of reports of gunshots heard in Oxford Circus. Armed police responded to the incident as a gunfire one, British Police have said, but no evidence has been found yet and nearby stations have reopened. Oxford Circus is expected to reopen soon. 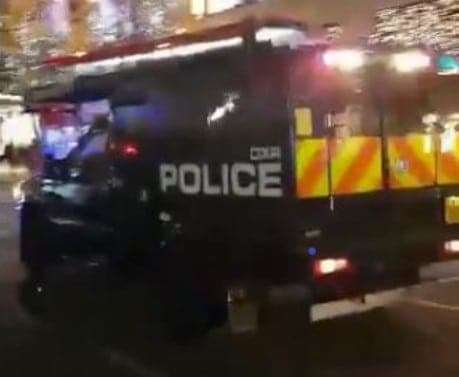 Reports are emerged of armed police responding to an incident in Oxford Street Station on the busiest shopping day of the year as bargain hunters descended on London’s West End for Black Friday. British Transport Police advise people to stay away amid social media reports of people running away from station entrances. They had asked people in the area to stay indoors as thousands of shoppers were evacuated. They have not confirmed the nature of the emergency, and there are unconfirmed reports of shots fired and smoke. London Fire Brigade report 3 fire engines and 15 fire fighters called to an incident at the Underground station at 4.43pm. As more police continue to arrive, police report one minor injury a woman sustained leaving the station. Black Friday deals shoppers were shaken after people were seen fleeing the station in a stampede.